Description: The most fundamental technique for a Dark Release user. In outline, this jutsu is able to absorb any kind of ninjutsu even one far stronger than the user's capability. Thus, the absorption process is different regarding the rank comparison. 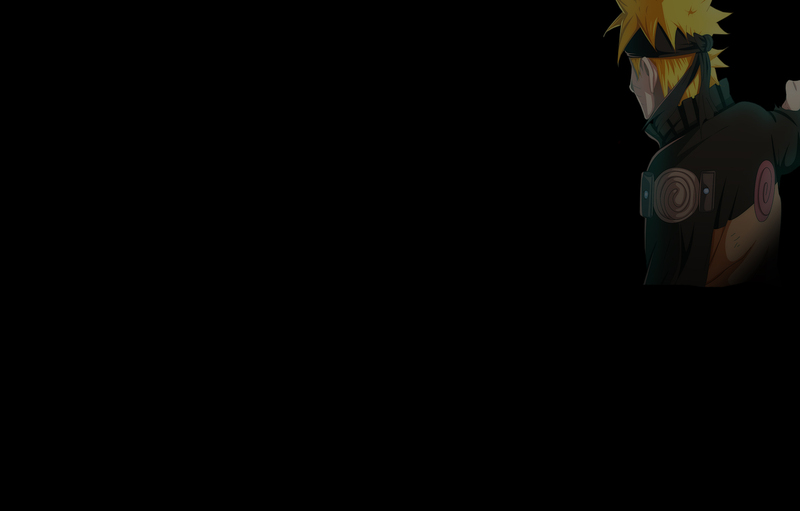 The absorbed jutsu will be stored inside the Dark Release sigil and can be used for many purpose. To absorb a jutsu ONE Rank below or more; requires a 1 post duration process; the stored jutsu can be used anytime. To absorb a jutsu on the same rank; requires 1 post duration process; the stored jutsu must be reversed immediately. To absorb a jutsu ONE Rank above; require 2 post duration process; the jutsu cannot be stored. To absorb a jutsu more than ONE Rank above; require 5 post duration process; the arm or weapon of the user will be shattered. Description: Another signature dark release technique. Like the other dark release technique, this jutsu need one stored jutsu within the sigil; This jutsu is the process of simply reversing the absorbed jutsu. The chakra used, the elements, the duration and any drawback from the reversal jutsu will applied as well. Description: This jutsu generates long, fibrous, malleable chakra strings from each of the user's fingers. They are partially intangible to prevent tangling; this jutsu cannot be used to bind people. The condensed chakra takes a hue of variable color depending on the user. Use of this technique on puppets is only available to those with the Kugutsu specialty. However, people without skill in Puppetry can still generate chakra strings to control weapons they have the specializations to wield, within 30m. This consists of whipping them around like a flail or yo-yo, or controlling their path of travel when thrown. The user pays a certain amount of chakra upon activation to determine the strings' durability; if severed the strings can be reattached to the same target for 15 chakra. 5 chakra = D-rank jutsu that cause blunt-force, cutting, or piercing damage can break the strings. 10 chakra = C-rank jutsu that cause blunt-force, cutting, or piercing damage can break the strings. 15 chakra = B-rank jutsu that cause blunt-force, cutting, or piercing damage can break the strings. 20 chakra = A-rank jutsu that cause blunt-force, cutting, or piercing damage can break the strings. 25 chakra = S-rank jutsu that cause blunt-force, cutting, or piercing damage can break the strings. Description: By using the Body Flicker Technique, a ninja can move short to long distances at an almost untraceable speed. To an observer, it appears as if the user has teleported. It is accomplished by using chakra to temporarily vitalise the body and move at extreme speeds. The amount of chakra required depends on the overall distance and elevation between the user and the intended destination. The Body Flicker Technique CANNOT BE USED IN COMBAT. It can only be used to enter, or leave, a thread. Description: A technique that physically restrains an opponent, as if the opponent had been tied in invisible steel ropes. It debilitates the victim for a short period of time, which allows the user to either strike again, or take the target into custody. This is a D-rank ninjutsu where the intensity will vary greatly according to the user's level of skill. This jutsu will only work on people who are your rank or lower. If used on someone of your rank, there is only a 50% chance of the jutsu succeeding. The jutsu can be cast on a maximum of 3 targets at once. Description: This jutsu requires no hand signs; instead the user raises their hands so that fingers are spread wide and the palm is flattened and facing inward, the tips of the middle and ring fingers touching the user's temple and face. The user then channels a burst of chakra to the hands, releasing it instantaneously as a blinding flash of light. The flash is bright enough to stun for 1 post and blind for 2 more post anyone standing within a fan shaped radius of 10 meters in front of the user. Description: An extremely simple jutsu in practice and function; the user merely focuses a small amount of chakra to the pad of the thumb of their dominant hand and then snaps their fingers normally. This causes a small burst of sparks to fall to the ground. This jutsu is meant to be a quick ignition source for other jutsu; but may also be used as a distraction. The sparks are no hotter then what fall from a child's sparkler and cause no damage; but the sting can make for a useful surprise. Description: The user inhales deeply; mixing chakra in their lungs and throat to produce a thick cloud of black smoke over a specified area. Within the smoke cloud the visibility is reduced to less then three feet. The smoke is not-lethal; but it does sting the eyes and lungs; causing anyone caught in it to cough, wheeze, and tear up. Can be dispelled with a Wind jutsu of equal or higher rank. Description: After performing the necessary hand seals, the user breathes out a flammable mist, that once it meets with an ignition source, explodes into a large fireball. The explosion is on par with an Explosion Tag, however over a far larger area. Can cause mild second degree burns and concussive bruising. Description: Fire Release: Fire Stream (火遁・火河流, Katon: Hikaryuu) is a low-ranking Fire Release technique that can create a small stream of fire by inhaling deeply and focusing fire chakra to the throat to ignite the air as it is exhaled from the user's mouth. The flames are not very damaging overall, and the jutsu is best used as an ignition source for other jutsu or as a distraction. Description: The user grabs the opponent's throat clenching it, and then throws them onto the ground with a violent force. Description: This move simply entails the user squeezing the target's face with his hand. This move however, also has offensive uses as an actual technique, taking the opponent by the face, and slamming them into the ground. Description: Using simple, yet effective strikes, the user begins to spin rapidly and with a strong rotative high kick hits the opponent. Description: A taijutsu where one launches a succession of high kicks and low kicks. Firstly, the opponent's evasion margin is restrained upon seeing the high kick, thus augmenting the chances for the low kick to hit the mark. So originally the high kick is little more than a feint. Description: This technique consist of a very simple, but powerful, kick delivered to the side of the opponent - aimed at causing damage to the ribs. A powerful user of Taijutsu can use this technique to break a rib with relative ease. Description: A very powerful crouch and tackle. Using this technique, even a small practitioner can bowl over a much larger opponent. Description: This technique begins in much the same manner as the Leaf Gale technique, utilizing a simple rear spinning low kick in order to throw an opponent off balance. Following this, the user quickly raises themselves upright before the target can regain their balance and attacks with a series of palm strikes delivered to the chest to push them back and keep them disoriented. Description: This technique is simply a low-sweeping flipping forward kick quickly followed by another slashing kick with another leg. This is a basic taijutsu skill used to trip up and knock back opponents. However, by infusing wind chakra in their legs, the user can either slice into their opponents using wind chakra or increase damage and add a powerful knockback effect. Cooldown: Three posts after the last clone is destroyed. Description: Similar to the Clone Technique, this technique creates clones of the user. However, these clones are actual copies, not illusions. The clones are capable of performing techniques on their own and can even bleed, but will usually disperse after one or two solid blows. They can also disperse on their own. The clones will be created in roughly the same condition as the original. Shadow clones can't be distinguished from the actual person even by the Byakugan because the clones have the exact same amount of chakra and aren't made from any other substance. A characteristic that is unique to the Shadow Clone Technique is that any experience the clones gain during their existence is transferred to the user once they are dispersed. This makes the technique ideal for spying, since the user can simply send a clone to spy on a target, then have the clone disperse itself without returning to pass the information back to the user. When using clones for training the following information is what you need to go by for reductions to your word counts. If you're overall chakra goes down below 20 you will lose consciousness, if it goes below 15 you will die. Description: To perform this technique the user raises his sword above his head and collects a large amount of wind chakra upon his/her sword which is signified by chakra swirling up and around the user before concentrating upon the user's blade. Once the user has collected the amount of chakra that they wish to use they will releases the mass of wind with one powerful swing of the sword. The resulting effect is a large amount of destruction in a wide angle in front of the user for a distance up to 45 meters. Description: The user is able to expand upon the usage of the constant Chakra Radar and scan much more of a distance. As the range increases, so do the details of the scan. A user can use a scent to track a specific person. Once found though scanning, the user can "zoom in" and even "lock-on" to the person or scent. People underground or using Doton Techniques to cover themselves are invisible to the scan. Being interrupted or startled while expanding the Chakra Radar can over-whelm all senses and stun the user for up to 3 posts. D-Rank: The user is able to scan a small area, roughly the size of a yard. People and animals in the scan that are outside of this radius appear as intangible blobs, and it is almost impossible to distinguish between the two. C-Rank: The user is able to scan a larger area the size of a city block. People and animals in the scan that are father away are becoming clearer and can be seen. B-Rank: The user is able to scan an area the radius of about 5 city blocks. Chakra appears as colors in the scan. Male, Female and animals each have their own color and can be distinguished by such. A-Rank: The user can scan an area the size of a village. The radar is so accurate at this state that the user can see clear details such as clothing, scars, tattoos and facial features. S-Rank: The user is able to scan an area the size of a country. The radar allows the user to see places and other people in crystal clear detail, just as any average person would. SS-Rank: The user can not only scan the entire country they are currently in, they can also see half of the next country over. Chakra natures appear in different colors, allowing the user to see what is being used on them in order to form counter measures. SSS-Rank: The highest form of the Holeman Chakra Radar, the user can scan the country they are currently in, as well as the next country over. At this rank, the user can send out a pulse from their body that affects people differently. Friends will find their perception raised to the maximum, granting them incredible clarity and the slight ability to see attacks before they are fully executed. This effect can last up to 5 posts. Enemies will be affected differently. They will find their Perception lowered 3 ranks, hampering their ability to perceive incoming threats. This too can last up to 5 posts. This ability can be used with no drawbacks up to 3 times per thread. After the third use, the user will suffer headaches, nausea, and their Perception will drop 3 ranks every time it is used. Description: This ability allows the user to use Chakra Radar to learn moves that they see. To do this Chakra Radar must be in use; it cannot be used without chakra radar. The chakra needed to learn a move depends on the move being learned: the chakra must be equal to that of the jutsu itself (D rank chakra for a D rank move, ect). This can be used to learn multiple moves at once, however chakra must be paid for each and every jutsu being learned. This can only be used to learn abilities the user has the appropriate elements and specs for.